This topic describes how to use Direct2D and GDI together. There are two ways to combine Direct2D with GDI: you can write GDI content to a Direct2D GDI-compatible render target, or you can write Direct2D content to a GDI Device Context (DC). This overview assumes that you are familiar with basic Direct2D drawing operations. For a tutorial, see the Direct2D QuickStart. It also assumes that you are familiar with GDI drawing operations. To draw Direct2D content to a GDI DC, you use an ID2D1DCRenderTarget. To create a DC render target, you use the ID2D1Factory::CreateDCRenderTarget method. This method takes two parameters. The first parameter, a D2D1_RENDER_TARGET_PROPERTIES structure, specifies rendering, remoting, DPI, pixel format, and usage information. To enable the DC render target to work with GDI, set the DXGI format to DXGI_FORMAT_B8G8R8A8_UNORM and the alpha mode to D2D1_ALPHA_MODE_PREMULTIPLIED or D2D1_ALPHA_MODE_IGNORE. The second parameter is the address of the pointer that receive the DC render target reference. The following code creates a DC render target. In the preceding code, m_pD2DFactory is a pointer to an ID2D1Factory, and m_pDCRT is a pointer to an ID2D1DCRenderTarget. Before you can render with the DC render target, you must use its BindDC method to associate it with a GDI DC. You do this each time you use a different DC, or the size of the area you want to draw to changes. The BindDC method takes two parameters, hDC and pSubRect. The hDC parameter provides a handle to the device context that receives the output of the render target. The pSubRect parameter is a rectangle that describes the portion of the device context to which content is rendered. The DC render target updates its size to match the device context area described by pSubRect, should it change size. The following code binds a DC to a DC render target. After you associate the DC render target with a DC, you can use it to draw. The following code draws Direct2D and GDI content using a DC. When you use an ID2D1DCRenderTarget, it renders Direct2D content to an internal bitmap, and then renders the bitmap to the DC with GDI. 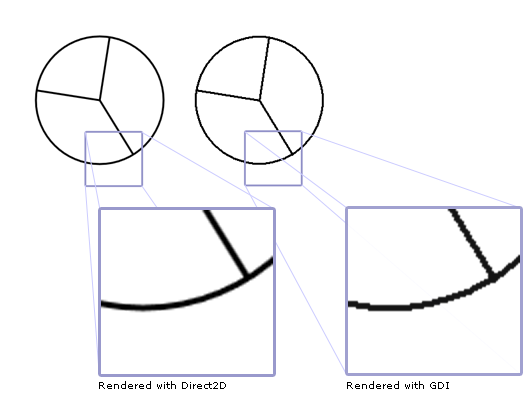 It's possible for GDI to apply a GDI transform (through the SetWorldTransform method) or other effect to the same DC used by the render target, in which case GDI transforms the bitmap produced by Direct2D. Using a GDI transform to transform the Direct2D content has the potential to degrade the visual quality of the output, because you're transforming a bitmap for which antialiasing and subpixel positioning have already been calculated. In some cases, it might not be obvious that GDI is performing additional processing that might degrade the quality of the Direct2D content. For example, on a right-to-left (RTL) build of Windows, content rendered by an ID2D1DCRenderTarget might be horizontally inverted when GDI copies it to its destination. Whether the content is actually inverted depends on the current settings of the DC. Depending on the type of content being rendered, you might want to prevent the inversion. If the Direct2D content includes ClearType text, this inversion will degrade the quality of the text. The previous section describes how to write Direct2D content to a GDI DC. You can also write GDI content to a Direct2D GDI-compatible render target. This approach is useful for applications that primarily render with Direct2D but have an extensibility model or other legacy content that requires the ability to render with GDI. // Create a GDI compatible Hwnd render target. In the preceding code, m_pD2DFactory is a pointer to an ID2D1Factory, and m_pGDIRT is a pointer to an ID2D1GdiInteropRenderTarget. Notice that theD2D1_RENDER_TARGET_USAGE_GDI_COMPATIBLE flag is specified when creating the Hwnd GDI-compatible render target. If a pixel format is required, use DXGI_FORMAT_B8G8R8A8_UNORM. If an alpha mode is required, use D2D1_ALPHA_MODE_PREMULTIPLIED or D2D1_ALPHA_MODE_IGNORE. Note that the QueryInterface method always succeeds. To test whether the ID2D1GdiInteropRenderTarget interface's methods will work for a given render target, create a D2D1_RENDER_TARGET_PROPERTIES that specifies GDI compatibility and the appropriate pixel format, and then call the render target's IsSupported method to see whether the render target is GDI-compatible. The following example shows how to draw a pie chart (GDI content) to the Hwnd GDI-compatible render target. // Draw the pie chart to the GDI render target associated with the Hwnd render target.